Did you know that proactive selling could increase service revenues by up to 160% within a year? It can, and your company has the power to transform its field service business, whether you know it or not. 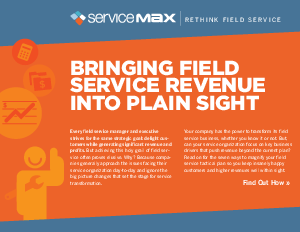 Magnify your tactical plan and push revenue using this essential guide, Bringing Field Service Revenue Into Plain Sight. Gain a greater understanding of the big picture, and how you can transform your field service business for the better. Learn seven strategies to keep up with the industry and how harnessing new technology will lead to happier customers and greater revenues.